Hi. I'm Victoria Hefty, and welcome to Activate Purpose, where I talk about finding purpose through action while balancing motherhood and career. 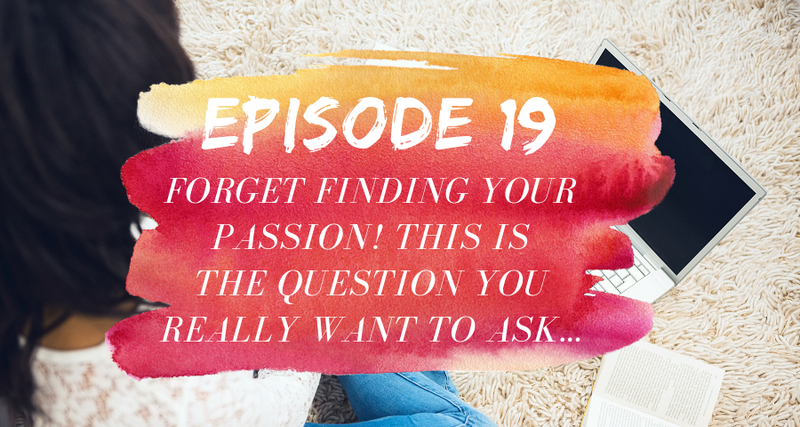 In today's episode, I'm going to share why follow your passion just doesn't work for most people, including me. I'll talk about how an article that a friend shared with me gave me a whole new perspective on finding my purpose, and why I should be asking myself a completely different question. Learn how that one question led to a weekend full of discussion and discovery for me and my husband. This recording is what I'm informally calling the final part of the I'm back from my hiatus series, where I talk about the lessons I learned this summer while taking an unplanned break from podcasting. I recommend you check out those two episodes first. So, Episode 17 and 18, before you listen to this one, so that you can get a full picture of how my evolving has evolved over the last few months. Let's get started. I recently had a really lovely friend of mine share an article titled, Is Your Life Designed for You? This article is featured in Mindful Magazine. The article goes on to talk about why, and I quote, "Waiting and hoping for a perfect opportunity won't get you closer to the life that you want." I'll share a link to that article, but please know that it's behind our subscription wall, so if you really want to read it, then email me at Victoria@activatepurpose.com, and I'll share a workaround. The article follows this guy called Bill Burnett. He's the executive director of Stanford's design program. He was the founder of EA, or electronic arts. You know, the gaming system, or gaming program. I don't know anything about that world, but basically he was really big into sort of that Silicon Valley world, and then kind of shifted direction, and now he, again, is the executive director of Stanford's design program. In the article, he explains how applying design concepts to finding a career can allow undergraduate students to think differently about potential career paths. The article actually talks about a lot of different things, but for the purposes of this podcast, and keeping it relatively short, I'll focus on the part that I personally found the most interesting, which I'll read certain excerpts verbatim below. First, the paragraph that sort of immediately caught my attention stated, and I quote, "In Burnett's view, one of the most common obstacles people face while trying to make that leap is the widespread dysfunctional belief that once you find your quote/unquote, true purpose, everything else will magically fall into place. But research by Stanford's Center for Adolescents shows that only 20% of people age 18 to 26 have a clear vision of what they want to accomplish in life, and why?" Burnett then goes onto say, and I quote, "For most of us, passion is an end product. You discover passion by working hard on something. If you have a passion, that's great, but this passion thing leaves eight out of 10 people out of the conversation." I think that's worth repeating again, that last line. "This passion thing leaves eight out of 10 people out of the conversation." So granted, I'm not in the 18 to 26 year old demographic that the study focused on. I'm actually 36, for those of you that are curious, but I would be willing to bet that roughly eight out of 10 of my peers feel the exact same way, give or take one or two people. The article finally then goes on to say, and I quote, "Another motivation killer is the idea that if you haven't figured out your life by a certain point in time, you're already too late." Burnett says, "That's ridiculous." And then goes on to say that, "Several longitudinal studies show that most people don't fully form their adult self until 35 or even 40." He ends by saying, "And after that, you get to reinvent that self over and over again." I don't know about you, but I personally felt really relieved, and more importantly, understood by these two paragraphs. I'm pretty sure that I've mentioned in earlier episodes of this podcast that I struggled, and still frankly struggle, with this passion question. I don't have one. Maybe it's because I come from an immigrant family. Actually I'm an immigrant myself, where passion and pursuing your purpose, especially from my parents' generation, was a luxury that we just didn't discuss. It was more about day to day survival in a new country. Paying bills. You know the story. Or maybe I was just so fixated on becoming a corporate executive that I didn't see myself as anything else. I'm sure there's probably a ton of reasons why I don't have a passion, but I have to admit it's kind of really embarrassing sometimes to say that, because it really makes me feel inadequate. Like I don't have my stuff together. Maybe it's like I'm none of them. I feel like I'm not an interesting person or something. Like I don't. I've always like, "I have interests sort of, but I don't have a passion." I don't know. Just like it's a conversation staller. I just hate the question. I'll just put it out there, I hate that question. The ironic part is I know people struggle with this question like I do, but then again, no one really wants to talk about it, right? They don't want to talk about the struggle of answering this question. We all just make something up that sounds good, for either the interview, or maybe a first date, or if it's a network setting where that question comes up. You come up with something that hopefully somewhat ties into your background, and you hope you move on to the next question. So, where did I go with that information from the article? Well, further in the article, it talks about the different ways you can design your life by asking yourself various questions, such as imagine three perfect days where each day meets some criteria. So for example, one of the days would be, imagine you're doing exactly what you're doing now. What is a perfect day in the next five years? Or one of the another criteria was, okay, well imagine that money or time isn't an issue. In five years, imagine the perfect day. What would that involve? I mean, I've heard this question before, so again, it was useful but it didn't really get me inspired. What did get happen, actually, after I read the article was I began doing research. I'm kind of laughing, because this should be no surprise for anyone that knows me. I love, love, love doing research, and just, I don't know, enjoy the hunt or whatever of finding little known gems on the internet. So I started researching the Bill Burnett guy, and then the Stanford design program, or the terminology Design Your Life. I actually stumbled on a free course. It's two to three hours, so I'll call it a module, but you can take on Stanford's website. It's called Engineering DYL SELF PACED Designing Your Career. As of today, so that's October 3, 2018, it's still available online for free. The module, I'm going to call it again that because it's short, is designed for undergraduate students, but I did it and I still found it helpful, especially the first few questions. The links will be available in the show notes, so don't worry about capturing all that information. So, what was that question? Well, the module asks, once you sort of fill in, you register, you fill in your information, you do a quick survey about where you are in life, I guess, and why are you taking this course, is ... The quote says, "In designed thinking, we start from a place of curiosity. So take a moment to consider what you are curious about as you start looking for opportunities. List five jobs, organizations, or industries that you are curious to learn more about." End quote. At first I was like, "Huh? Curious. Well I don't know. It's kind of a weird question for me." At first I struggled to come up with one thing that I was curious about professionally, let alone five. I just kind of had to sit there for a little bit, but the more I thought about it, the more I actually really loved this question. You know why? I I guess because there was no pressure to be right, and no pressure to just focus on one thing. So, before I started writing, I decided to give myself the freedom to write down whatever came to mind, and to try not to be ashamed or critical of my own responses. I said, "I'm not going to make up some lofty curiosity because it sounds great. I'm just going to write what comes to mind." I'll share what I wrote with you guys verbatim. Again, don't judge me. This is just what I wrote in my free state of mind. It might not be mind blowing. That's not the goal. The goal was just to complete the task in the privacy of my own home. Okay. So here we go. This was my, again, my response to the question, list five jobs, organizations, or industries that you are curious to learn more about. Then I also included, I guess it was more for myself, a little sentence or description for why I had selected that item. I just wanted to be able to, if I had to go back and re-look at this exercise, kind of understand my rationale. The first one was media, so I wrote media, which is to me, I was defining as publishing regular content on topics that interest me, like career, politics, motherhood, et cetera. I wrote, my rationale was I love to read and research, and feel like I'm constantly consuming this media in one form of another. I created a pregnancy blog purely driven by satisfying that curiosity. So, if I had more time and resources, I would definitely be more curious about getting involved in that industry somehow. Second one, entertainment. This is one I struggled with. So I wrote, I know it's shallow, but I think the entertainment industry is a fascinating one. Not the gossip so much, but the fact that I feel like Hollywood is a very strange and eccentric place, but it also attracts some amazingly talented people, or sometimes, you know, not so talented. I'm just kind of fascinated by it all.I don't have some deep intellectual reason. I just, it asks what I'm curious about, and that's something that came up, so I wrote it down. The third one was coaching or mentoring. This is one where I wrote, I hate the concept of a life coach, but I also think I tend to give good advice that can genuinely help people navigate their life. Aside from my aversion to some aspects of the field, I hate to admit that I am curious about what it takes to become one, and whether or not I would be a good life coach. I just am. I don't know. I have a love hate relationship with it. Four. Writer. I wrote, I think I have a lot to say, and while I may not be a great grammatical writer, or blow you away with my prose, I do have a relatively strong point of view when I do write, and I love sharing my ideas and thoughts with people. So, writing is another curiosity where, if I had unlimited time and maybe even went to a writer's retreat, could be something that I explore more of. Then lastly, I wrote either like a host store, like an interview personality. So, I'd love to interview people and learn more about their experiences, and what makes them tick. It's the best part for me, whenever I'm at a dinner event, or even networking event, is getting to know people. What experiences shape them? How do they make decisions? How did they get here? I don't know. I just personally love that stuff. It could be the extrovert in me, or just could be that it's an aspect of, I think, building relationships that I genuinely enjoy. I know I have a podcast but I'm not really talking about interviewing people for the podcast per se, but it was more of an Oprah Winfrey journalistic type of curiosity. So, I wrote, I'm definitely curious about this area and maybe I could explore more ways to maybe incorporate more of that into my own podcast. I just hadn't seriously thought about it before this exercise. So again, those were my five. Media, entertainment, coaching, writing, and sort of an interview personality. It may not be the most interesting list for you, but I did notice, when I reviewed my list and started walking my husband through the exercise, this was maybe that evening or the next day, it might've been the next day. I told my husband I had done this exercise the previous night, and I wanted to share some of my ideas with him, and we were driving. I think we were on our way, I don't know, driving to a mall, and our daughter was sleeping in the back of the car, so it was a perfect time to get some adult conversation. If you're a parent, you know exactly what I'm talking about. I wrote, I noticed these two things.Actually, I didn't write. I noticed these two things as I was talking to my husband. One, in my list, I actually wasn't curious about a specific company or organization, right? Because that was one of the things. It was five jobs, organizations, or industries, and I wasn't curious about it. Company or organization, and I realized that my curiosity isn't really based on the allure of a company, and maybe that is indirectly telling me that while I may eventually return to sort of the traditional corporate workforce, it's not something that I'm necessarily compelled by at the moment, or maybe even in the future. Then the second thing I noticed was I didn't mention anything related to strategy, consulting, or healthcare. Right? Which is, I don't know, funny or kind of bad, because that is my professional area of focus at the moment. You know? I'm a strategy and market research consultant for companies that are primarily in the healthcare space. So, I almost started to panic when I realized that I wasn't curious about anything related to this area, but then it hit me. Well, why would I be curious? Right? I'm actually doing this. I'm in the field. I'm in strategy. I'm in consulting. I'm in healthcare. I've done that for the last 10 years on and off, so maybe there isn't really anything to be curious about in the same way as I would be curious about something that I either hadn't dabbled in, or just have thought of. I think maybe it's telling me that I don't have, either I don't have a long career ahead of me in any of those fields, or maybe it's just okay to say that, you know, I'm just not curious about them. I enjoy what I do actually. I enjoy it much more now that I'm a consultant and have a lot more control about who I work for. It gives me the income and the freedom I need to work, but still be the primary care taker for my daughter, so I'm not complaining. I just noticed that I didn't write even anything remotely close to strategy consulting or healthcare. If you have any thoughts on that, I would love to know, and please email me. I did ask my husband after. I always like to incorporate him, or through my journey, as you'll notice he did a guest podcast earlier, which I'll include in the show notes as well. I like to sort of include him in my decision making, so he doesn't think I'm just doing all this random stuff. So I asked him. He's actually an academic and philosopher by the way, to complete the exercise that I did. He actually really struggled with this. He was so hard on himself. It was actually hilarious. He kept on saying that he had lost his imagination. He was getting angry. I told him, "Don't overthink it. Just focus on what naturally comes to mind." Which is really hard to tell a philosopher to do. You know. Don't overthink it. That's what you do for a living. But I told him, "Without forcing what you think the answer should be, just tell me what comes to mind." Then eventually, because he's a thinker, he came up with ... I remember four of them. I don't remember the last one, but he came up with art. Art history, architecture, car design, and drawing, and painting. Again, there's one other one that I can't remember, but those were four. When he finished sharing his curious areas, my immediate thought, with the exception of architecture, right, because he comes from a family of architects, was that one, he had a lot of curiosity around aesthetic things. Two, in all of the years that we've known each other, I don't really think I've seen him do anything even remotely related to these fields, outside of skimming the occasional magazine, or maybe reading and sharing an article with me, but pretty much I've never really seen him actually tangibly do anything to, I don't know, pursue even slightly a curiosity in those areas. So, I told him that, my observation. He was like, "Yeah, I know. It's pretty depressing that I haven't." It led to a great discussion between us about how maybe, you know, we can work together and he can start incorporating some of this curiosity right now in small ways. One of the things is, I think it's so easy, especially as a parent, to get caught up in the day to day work, then you come home and you have to sort of be with your child, or multiple children, and then you're sort of laughably trying to squeeze in a few moments of personal time before bed, you know, if you get that. My daughter has a tendency of coming out right now when she's supposed to be in bed, so that kind of ruins any free time you have, and then before you know it, it's time to go to bed. Years go by and you realize that you haven't really stayed in touch with what you used to be curious about. Which leads me to my final thoughts on all of this. I think we are all focusing so much on trying to answer the difficult passion question that perhaps we would be better off thinking about what we're curious about, like I did. My challenge for you today is twofold. First, ask yourself the question, what are five jobs, organizations, or industries that you are curious to learn more about? Remember, don't overthink it. Give yourself the freedom to pick areas that other people may not quote/unquote "Approve of," or that don't seem lofty. They just have to be curious. That's the only criteria. You just have to be curious about them. You don't have to prove anything to anyone. Remember, this exercise is just for you. That being said, the second part of the challenge, if you're up for it and feel comfortable of course, is to find a friend, family member, spouse, partner, whoever, and ask them that same question. So, tell that person what you picked, and then give each other feedback on what stands out about your respective responses. I think it's much easier to ask this question personally, than walking up and asking a friend what their passion is, again, for the reasons I mentioned. I think that a lot of great discussion could be had, and you might walk away feeling lighter, and perhaps like me, more open about future possibilities for what you want to pursue, whether that's professionally, or just a personal curiosity that just fulfills your life. I would love to hear your thoughts. If you feel like sharing, again, your experience, or you just have questions about the article or whatnot, so you can email me at Victoria@activatepurpose.com. Again, I will include links to the article in the Stanford course in the show notes, which you can find at activatepurpose.com/episode 19. Finally, if you enjoyed today's episode, make sure to leave a review, and subscribe to next week's episode. Until next time.